The Ford Mustang is a symbol for nostalgia. It’s a vehicle that beckons memories of the good ole’ days of the American muscle car. So it's natural that it would be in line for a retro facelift. It looks like a vintage upgrade is coming sooner than expected. Ford recently announced a number of old school touches will be added to their 2018 Pony Package. While the model includes modern sensibilities, it’s also loaded with retro features like a chrome corral and a tri-bar pony badge on the rear. A stripe above the side skirts helps to complete the classic look. The 2018 Ford Mustang Pony Package will include the return of at least one iconic item – the logo surrounded in a chrome corral. This marks the first inclusion of the badge design since the anniversary package in 2015. The “pony-in-corral” grill badge isn’t the only reason to get excited for the 2018 Ford Mustang. It will also include sleek new features like 19-inch polished aluminum wheels, bright beltline and window trim, and carpet floor mats with an embroidered logo. The Pony Package is a dress-up version of the 2018 Ford Mustang. It’s only available in an EcoBoost model that’s armed with a 2.3-liter turbocharged I4 engine. You cannot get this design with the 2018 GT with 5.0L V8. The future has arrived with an ode to the past. The 2018 Ford Mustang is expected to arrive at dealerships in October. Call us today to learn more about this new model. Do you love the look and feel of an SUV, but are put off by the bulkiness? If so, you’re not alone. Soccer moms and retirees alike are seeking out rugged, sporty vehicle options that don’t take up the whole road. Enter the Ford EcoSport. In response to this shift in SUV thinking, Ford is bringing EcoSport to the US and Canadian markets. According to Driving .ca, the big announcement was made on Snapchat, with DJ Khaled at the helm of the reveal. While this type of social media savvy message may not have caught the attention of the empty nesters, the buzz is quickly spreading. In fact, the EcoSport is already highly acclaimed in other parts of the world. According to Autoblog.com, it’s the best selling compact SUV outside of the US. 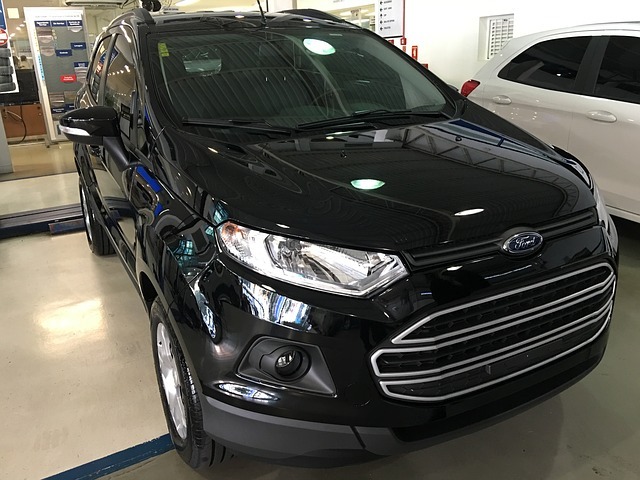 EcoSport’s sleek and sporty look has hints of both the Ford Edge and Escape, but definitely cuts a figure all its own. It has a streamline, but muscular style that is sure to please a wide range of buyers. Despite its trim design though, as explained on the Ford website, EcoSport’s interior is notably roomy, with ample head and leg space. Those interested in the EcoSport will have their choice of 10 colours and four trim levels. Higher end models have an 8-inch colour touch screen. The available Sync 3 technology with Apple CarPlay and Android Auto, push the intuitive nature of this vehicle over the top. Watch for EcoSport to hit the market in early 2018. To view Ford’s exciting current lineup contact us today.